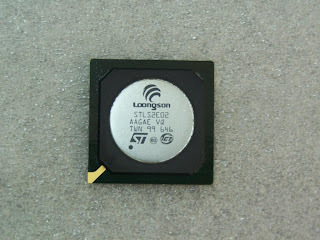 Actual performance of the China-made CPU, Loongson, is still in question. Many(maybe a majority of) Chinese themselves don't think Loongson can catch up or just somehow competitive with Intel or AMD one day in the future. Rationality is not flooded by patriotism in this case. "Too slow! Pentium III 667 came out many years ago!" A customer said when a reporter ask him if he would choose Loongson. It is true that Loongson is currently not comparable to any mainstream Intel or AMD products. Their x86 CISC CPUs has a long and glorious history, a wide software support and, most important, innumerable users. It is always difficult for any user to change from a popular platform to a uncommon one. What is worse, Windows will never be running on the CPU! The new-born baby Loongson has so long a way to go before it becomes a giant. Software is another issue. I'll only concentrate on hareware performance. Loongson 2E is designed for 1GHz frequency but failed to run stably under that condition for some technical problem. Normally, L2E can run at 600-800MHz with ease and is released as 660MHz in Lemote Box. Loongson official declared that L2E@1GHz achieved a score of 500 under test of SPEC CPU2000. What does this mean? 1. If we produce Loongson 2E @1GHz, rate of spoiled products will be too high to accept. 2. L2E reaches 1GHz only when the core voltage is 1.4V, which is larger than normal 1.2V. 3. The compiler is not GCC or something also common, but a special one developed by China Academy of Sciences. Some people also test L2E@660MHz using simple Unixbench. This is about what PentiumIII at same frequency can get. FP results are unbelievably low. Loongson official explains that L2E has 4 FP apparatus which give it ability to do 4 double FP or 8 FP computing in one clock period. But current compiler (gcc) can only use two of them. In addition, I heard that external hardwares such as north bridge, south bridge, main memory, etc. also restrict Loongson in terms of compatibility. All in all, we can just expect adequate much from Loongson2E. L2E is far from brilliant, yet the whole bluescript of Loongson is great. They have big potential. They are being improved. Given better hardware and software supports, Loongson 2F and Loongson3 should satisfy us more. 1. gcc (I checked version 3.1.1 which was released in 2002) does actually use the fused multiply add instruction on MIPS by default. The longsoon has a MIPS instruction set so the claim that gcc does not use it, is not sustainable. Furthermore the fmad instruction is far from 'advanced' the idea is actually quite old. So if You do not have any idea about benchmarks and did not even do them Yourself, well then just do not post them as they are just plain rubbish!